Congratulation to Muhammad Fahreza Alghifari (KOE) and Muhammad Wildan Zulfikar (KICT) for being 1st runner up in recent prestigious competition, the Innovate Malaysia Design Competition 2018 (IMDC 2018): Google Track, the largest design competition in Malaysia. The competition was organized by Dreamcather which gathered world-renowned companies such as Google, Intel, Keysight, MathWorks, Microsoft, SAS, SilTerra, and SOLIDWORKS to provide technological challenges as well as companies such as Celcom, Cyberview, Daikin, Exabytes, Telekom Malaysia and WCS Malaysia offered design challenges. The IMDC2018: Grand Finals which was held on the 9th of July 2018 at MagiC Cyberjaya. From more than 900 contestants, both Fahreza and Wildan were being shortlisted among 39 finalists. 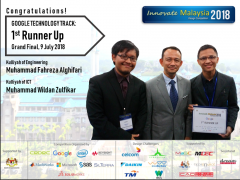 Their promising project was known as “Application of Speech Emotion Recognition using Google Tensorflow Deep Neural Network for Suicide Prevention Hotlines” (EMOS). Technically EMOS was supervised by Prof. Dr. Teddy Surya Gunawan (KOE). Psychological contents and logistic were supported by Counseling and Career Services Centre (CCSC). The same project was also being awarded “Best Project of the Region” (with a status of Excellent Award). We, from Kulliyyah of Engineering are very proud of their achievements! We hope their success will inspire the other students to strive for excellence.